The earliest Vladimir Guerrero baseball cards are a high-water mark in the era of trading card excess. 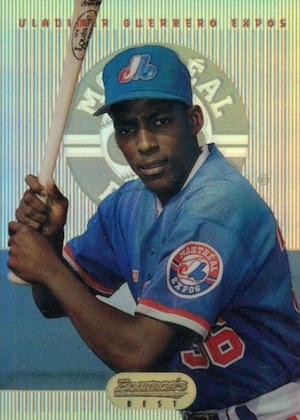 To this day he still enjoys hobby popularity, especially with fans of the Montreal Expos, where he became a star. 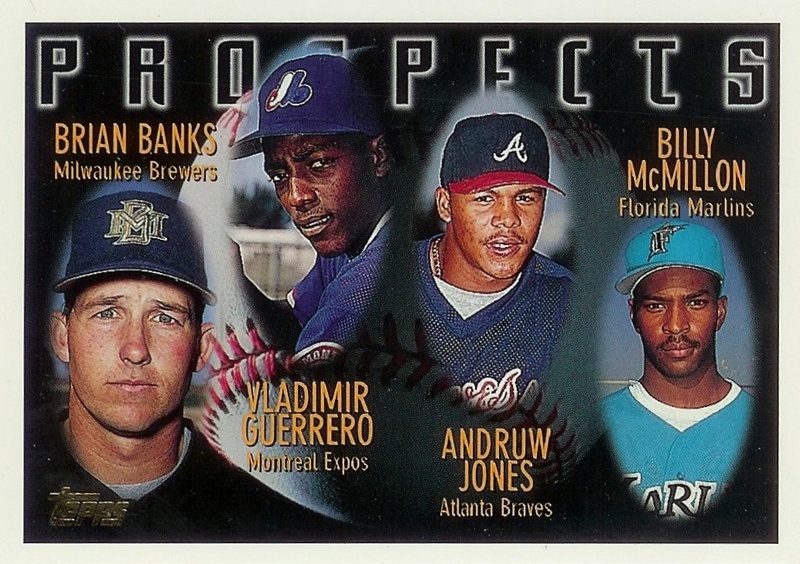 Debuting in the 1995 Bowman sets, collectors can find other notable offerings sprinkled across the '90s. 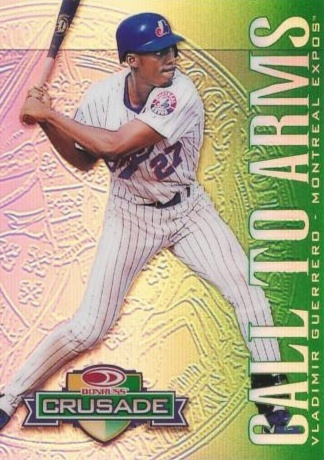 Check out some of the best Vladimir Guerrero rookie cards and more in the guide below. Vladimir Guerrero was the greatest slugger to ever wear the Expos uniform and he holds franchise records for home runs and batting average, earning him the nickname "Vlad the Impaler." He also found success in the American League with the Los Angeles Angels, capturing a Most Valuable Player Award. 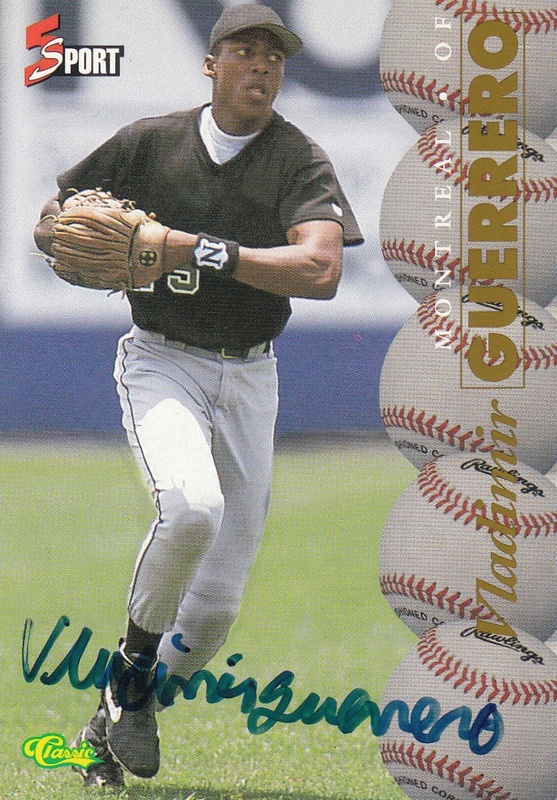 As his hobby career began in 1995, Guerrero's signed cards soon followed. 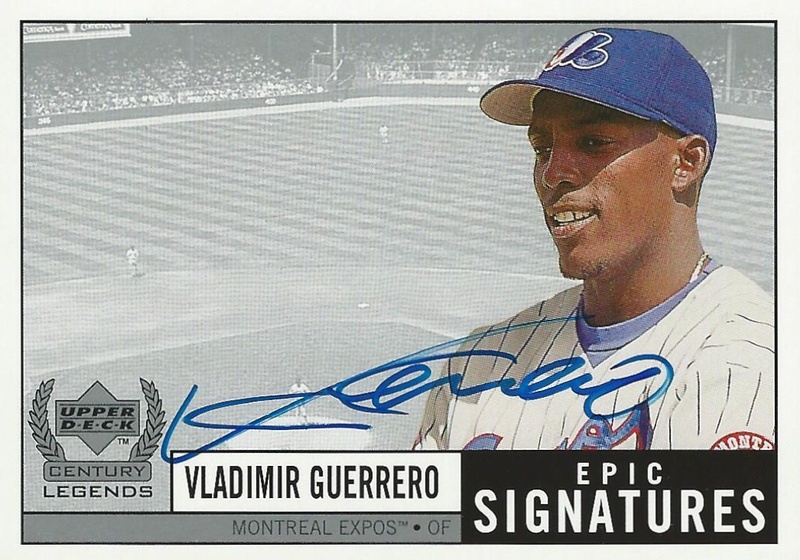 In addition to several noted in the list below, other key Vladimir Guerrero autographs include his die-cut offering in 1995 SP Top Prospects and his 1997 Bowman autograph. He has also signed for premium sets in recent years, including National Treasures, Topps Dynasty and Topps Five Star. Shop for Vladimir Guerrero Autograph Cards on eBay. Truly a family affair, Vladimir's son, Vladimir Guerrero Jr., is a top prospect with the Toronto Blue Jays. His first trading cards in 2016 Bowman and 2016 Bowman Chrome are very popular, particularly the autographs. Father and son even share a dual autograph card in 2015 Panini Elite Extra Edition as part of the Passing the Torch insert. While his enshrinement was delayed a year, Vladimir Guerrero (Sr.) entered the Baseball Hall of Fame on his second ballot. This should provide a nice boost for his cardboard interest. In selecting the top Vladimir Guerrero cards, key factors include value along with card design and the overall availability on the secondary market. 1995 Upper Deck Minors offered great photography of up-and-coming prospects and Guerrero is shown a few seconds before sliding. Along with the standard base card, Upper Deck issued a more limited parallel featuring a silver foil Future Stock stamp. For a slugger of Guerrero's power, he was also very quick on the base paths. Twice a member of the 30/30 club for home runs and steals, he fell one home run short of being in the 40/40 club in 2002. Of the 200 cards in 1995 Classic 5 Sport, 31 baseball players were featured on the checklist, including an early card of Guerrero. 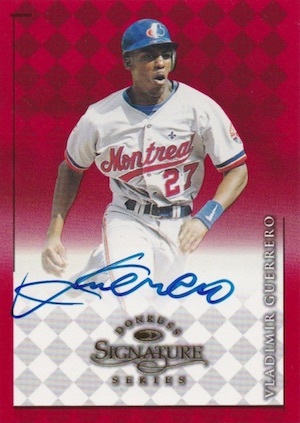 Each of the players also has a signed parallel and this is one of the first Vladimir Guerrero autographs of his career. For collectors, it also offers a chance to see how Guerrero's signature has progressed over the years. While he signed his entire name on this card, later certified autographs are more abbreviated. 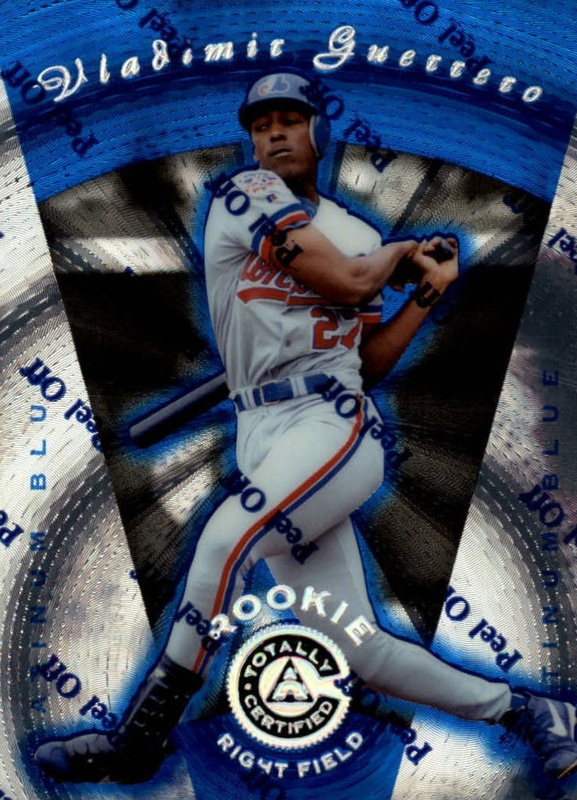 Guerrero's flagship debut came in 1996 Topps on a multi-player card that also has Andruw Jones. The other two players, Brian Banks and Billy McMillon, would have careers as utility men and pinch hitters. 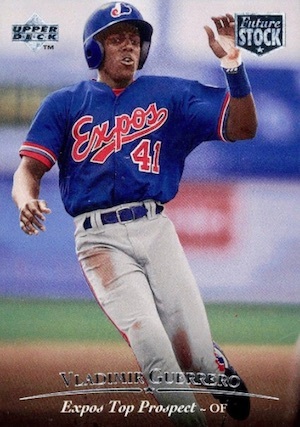 Although he became famous with the Montreal Expos, Guerrero inked his first major league deal with the Los Angeles Dodgers. Only on a 30-day contract, Vlad refused to sign a long-term deal with the team. While not every collector loves the multi-piece relic cards that spell out messages in Topps Triple Threads, they do offer unique options for some legendary players. 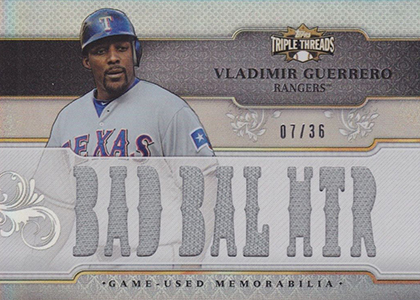 2014 Topps Triple Threads includes my personal favorite, featuring a "BAD BAL HTR" die-cut, which refers to Vlad's ability to hit pitches that are sometimes way outside of the strike zone. One famous example of this came when he hit a pitch that had bounced on the dirt in front of the plate. 1997 Pinnacle Totally Certified was spread across three smaller sets, each with increasing rarity. The most common parallel is the Platinum Red version, limited to 3,999 copies, followed by the Platinum Blue, featured below and limited to 1,999 copies. Finally, the oddly-worded Platinum Gold version is the rarest with just 30 copies. The cards featured a glass-like background that easily shows fingerprints, so Pinnacle included a removable plastic cover over the top of the card. Collectors generally place a premium on examples with the plastic still in place. I personally prefer autographed cards that are positioned horizontally and Guerrero has a great on-card autograph in 1999 Upper Deck Century Legends. I particularly enjoy how Guerrero's picture and his signature are the only pieces of color on the mostly black-and-white card. Along with the base autograph card in the Epic Signatures insert, the Century parallel with gold foil stamping is hand-numbered to 100 copies. A set within a set, the 1998 Donruss Crusade insert was included in 1998 Donruss, 1998 Update Series, 1998 Leaf, and 1998 Leaf Rookies & Stars. Mirroring the set's name, most of the 130 cards in the checklist were done using a medieval design with numbered parallels. However, a group of cards given the "Call To Arms" title have a different look. Based on a mistake at Donruss, these were printed and issued without any card numbers, unlike the rest of the Crusade set. The set remains one of the most popular Donruss releases from that era. 1995 Bowman has earned the reputation of having a strong RC checklist, and the Vladimir Guerrero rookie card is the most valuable option. The card design is fairly irregular as there is a reverse mirror image in green along the left side of the card. Although there are rare gold versions for some of the sets in '95 Bowman, Guerrero was not included. The Vladimir Guerrero card below is the base red version from 1998 Donruss Signature Series. In addition to the main edition with 2,100 copies, he also has parallel autographs in Millennium Marks, limited to 1,000 copies, while Century Marks has just 100 copies. Tapping into the family connection, Guerrero's brother Wilton also signed for the set. Compared to his earlier autograph on the list (at #9), Guerrero modified his signature to just use a large "V" for his entire first name, which I imagine was due to the number of cards he had to sign. 1995 Bowman's Best was structured in an unusual way compared to contemporary sets. Separated by design, veteran subjects show a red background while rookies and prospects (including Guerrero) receive a blue background. There are also 15 cards featuring both a veteran and rookie on a foil background. 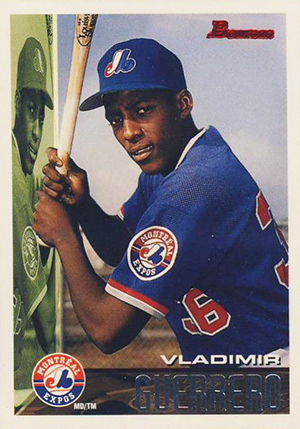 Completists and collectors with a large budget can try to track down the rare Refractor parallel of this Vladimir Guerrero rookie card (shown below) that fetches many times the value of the standard version. Stumbling across this reminds me to look through my old cards. Well, they’re not that old, but they’re not new. I have #1, #3, and #9. I MAY still have #8 and #10, but it’s been so many years since I’ve looked through all of my cards that I forgot if I had wound up getting rid of them at some point. Totally agree on the Classic autograph, too. My version, I assume, was early in the signing or when he was tired, as he actually went off of the edge of the card with the “o”… it came out of a box I received as a Christmas present the year that set was released. (I actually pulled both the Bowman RC and the Topps Guerrero/Jones cards from packs bought at local stores, as well… I bought the Best just to sort-of complete the set).